The upcoming result of the US elections will generate some sort of unknown future for Americans, and not everyone is happy about. There are many Americans who swore moving to Canada in case Donald Trump wins. In the meantime, there is a real chance to arrange one’s private life with brand new dating platforms, which arrived just in time. Maple Match is a project for those who seriously consider relocating to Canada. The platform enables single people to find a Canadian match effectively “saving them from the unfathomable horror of a Trump presidency.” Who knows, maybe Trump-loathers can use it as a real option to circumvent the difficulties of getting Canadian citizenship. TrumpSingles is another project of this sort, which offers to “Make dating great again.” If you are in love with Trump, but unhappy in your private life — welcome to the trumped network that unites potential partners adherent to same same political beliefs. There is a higher chance that your future relationship can be successful, at least you wouldn’t have problems making your political preferences obvious to your partner. However, such strategy may well work oversees, too. Brexit is already a cleavage for European politics, while in the coming future it may also become a relocating strategy. EU dating business should think of uniting the fates of Europeans regardless of much hated political decisions. Britain itself hosts a plentiful of successful dating companies to fill in newly emerged gap in industry. 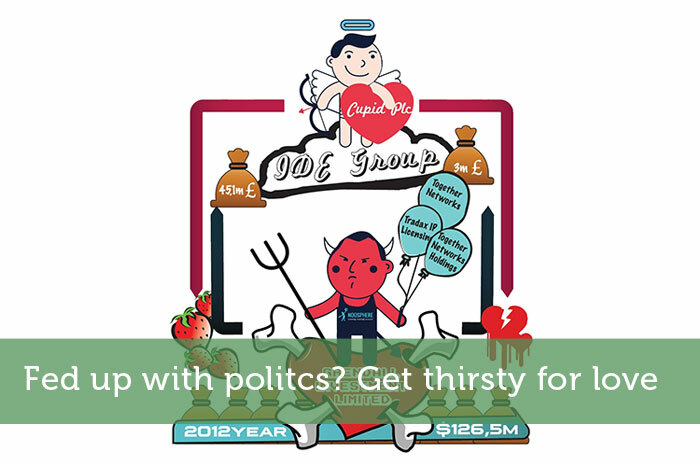 For instance, well known Cupid Plc was pioneering dating business in early 2010s. The company was established by a Scotsman Bill Dobbie and his Ukrainian partner Max Polyakov. In just a few years it managed to become one of the world’s business leaders in the dating category, operating with more than 85 m users from 58 countries. Shortly after Max Polyakov managed to sell his shares of Cupid plc at the peak of their value, and later took over all of its assets wrestling out other investors. It was possible due to media scandal instigated in the blogosphere; few months later BBC Radio 5 published its own investigation claiming that Cupid Plc hired fake profile managers in Ukraine, which forced users to buy paid services of the company. it is pivotal to be careful who you match with, be it in US or Ukraine. Love outlives everything.